I’ve been dipping my toe into the very scary world of publishing, because writing is a funny thing. The more I meet other writers, both online and in person, the more I realize we are all different and all motivated by different things. (Not shocking, since we are all people, who are inherently different and motivated by different things.) In my heart of hearts, I put words on paper so other people can experience the stories and worlds I create. It turns out that other writers are happy to write just for the process of writing. This I find fascinating, even while I’m a little jealous, and a baffled by their opinion. To build my portfolio, I’ve started submitting my short stories to journals, and I’m starting to amass rejections. (Four so far.) I found out about my most recent submission site, PodCastle, through Rati’s blog. In September they were accepting submissions for their Artemis Rising event which celebrates women identified fantasy writers, so I took a deep breath, did some wordsmithing (my story was 1700 words and they wanted at least 2000) and I submit right before the deadline. Hey everyone, we just closed our #ArtemisRising subs window. Want some stats? For those 16 or so episodes, we received 563 submissions. So about 3% of the stories will be selected. Whoa, I’ve got to say, I love this type of information, and appreciate that Escape Artists provided it. It’s way easier to look at stats like this and accept that your story might be good, but still be rejected. Then layer on that for PodCastle, which I submit to, there were over 200 submissions for 4 fantasy slots: data also reported on Twitter. My odds abruptly went down to a less than 2% chance of acceptance. Then four days after I submit, my odds went down to 0% with a rejection. But that’s a fair rejection. I dumped 300 new words into what was a lean and mean story to try and make it meet the word-count requirements of Artemis Rising. In hindsight — now that it has been rejected — I wish I hadn’t submitted. I wish I would have waited until PodCastle opened back up for normal submissions, so I could have submitted the shorter version of the story I worked really hard to tune and tone. But the twitter thread from Artemis Rising continued. So if you submitted a story? Pat yourself on the back. 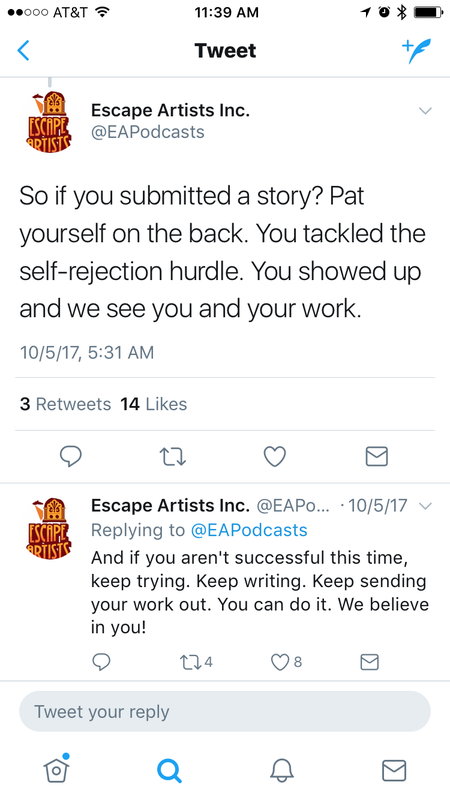 You tackled the self-rejection hurdle. You showed up and we see you and your work. And if you aren’t successful this time, keep trying. Keep writing. Keep sending your work out. You can do it. We believe in you! That’s when my epiphany happened. Someone read my story. Sure, they read my story and decided that it wasn’t in the top 2%, but they read it. And if you remember way back at the top, I said, “I put words on paper so other people can experience the stories and worlds I create.” Well, someone experienced my story and said it was interesting. Sure, it wasn’t the most interesting, but that’s okay. My first goal is to get a rejection that has some specific direction to how I can improve my work. My next goal is to get an acceptance. But the only way either of those will happen is if I keep letting people read my stories. Which is great. Because I want people to read my stories. So I’ll keep submitting and editing and hoping my work finds a good fit. How do I know my genre?!?! So, a L-O-N-G time ago I posted about the novel I’d finished writing, and had this super awesome list of things I was going to do next. Then life happened and the list items didn’t all ticked off. Sometimes I find I need a deadline or a reason to motivate me, so I signed up for a Writer’s Digest Bootcamp to have my first ten pages and query letter critiqued by an agent. The first thing I learned, that got my heart pounding, was that I had to define my genre. This was #6 on my list from August. Even back then I knew I couldn’t pick an agent until I completed this step, because agents specialize in certain genres, and I needed to pick an agent to review the first 10 pages of my novel and my query letter. Oh no. However, after searching like crazy, and even buying an awesome poster from Pop Chart Lab on “A Plotting of Fiction Genres” and hanging it up in my study – looking gorgeous but not helpful – I finally found a resource that makes sense to me: The Book Country Genre Map. This is an amazing, AMAZING site. I was quickly able to drill down into both Science Fiction and Fantasy and see how each genre was defined and what subgenres exist. I’ve pegged my novel as a contemporary fantasy subgenre (I think), but definitely in the genre of fantasy. Now, I may be totally wrong, but at least now I have the vocabulary I need so when I look at the Amazon site and see Books > Science Fiction & Fantasy > Fantasy > Epic under The Gunslinger, by Stephen King, I can translate it to Genre: Epic Fantasy. Sadly, I put this as one of my comparable titles, but I’m not epic fantasy. Thankfully this boot camp is a chance for me to make mistakes and learn from them so when I go to query agents with a completed novel I’ll know better. I have to admit, I’m loving this aspect of moving my book to the next stage. There is so much about this publishing world that I don’t know and it’s fascinating learning the lingo, the rules and the processes. It’s so different than my day job, but there are really interesting parallels. Item #6? 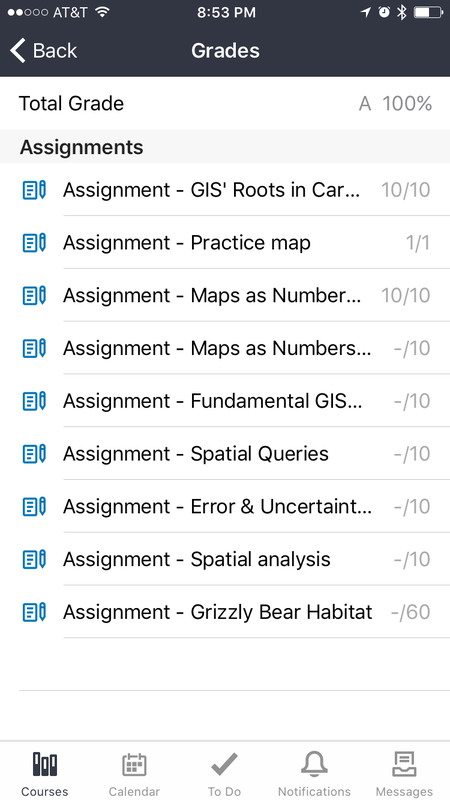 Done, and will help me finish #5, #7, and #8! Now I really need to get motivated to make a big push on the second draft so I can have someone other than me read this thing! On September 13th I had a dream. (Yes, I know, I hate hearing about other people’s dreams too. There’s a point. I’ll be quick.) I’m holding in my hands a book, well, not quite a book. It’s papers with book-like organization and book like shape and it has my story in it and pictures of me. Not quite my story, there are differences, but my story and weird pictures I don’t ever remember being taken, but they are of me. I flip through the unbound pages to the cover. Glimmer Train. “Oh,” a woman’s voice says, “You aren’t supposed to see that yet.” The story is The Fisherman, which I submit to Glimmer Train for their Short Story Award for New Writers award the end of August. In my dream I saw my story in the magazine. I have read countless articles and books on writing. Get it out there, they all say. Just keep submitting, they all say. Then they always say, “I didn’t even remember I had such-and-such story out there, when I found out I got published.” Okay, I know I’m a newbie, and I know this is my first submission but WHAT?!?! I’m going crazy here. I have a full time job, I’m a mom, I’m fostering two kittens from the animal shelter, I’m coaching my daughter’s soccer team and I still check my e-mail several times a day to see if I’ve heard from Glimmer Train yet. Are these other writers beings with hearts and souls of stone, or am I just nuts? I’m trying to keep my rose colored glasses on. I know the odds are slim. I know they get tons of submissions. I know no one gets published on their first submission. Why did I have to be the one who submit a story when they got a new computer system? But I haven’t heard anything yet so the excitement builds. Gasp. Maybe they like it. Maybe I’ll get published. Maybe it really is good. I think it’s good….sometimes. It’s like a writer’s Christmas Eve, but this time Santa really might not come, or he might bring me coal. Do you hear the reindeer’s hooves? I just checked. Still no e-mail. Still no update on my submission status. I’m still In Process – Your work has been received and is in the review process. Check guidelines for response times. Of course the guidelines are gone, because of the new system. This is like every user I’ve ever programmed for paying me back for moving stuff they want to find on a website. When will I move to Complete or *flutter flutter* Accepted for Publication? Nine more days, or sixteen…. Eighteen days ago my world turned upside down. I figured it would be no big deal to bring tiny kittens into my house and foster them. I’d feed them, clean their litter box, give them fresh water and continue on with my life as normal. No big deal. Three dead kittens later, eye drops, antibiotics, steam showers, and subcutaneous fluids have eaten up every spare moment I have and several spare moments that I don’t have. What the heck was I thinking? The care of these kittens has not just drained my energy, it has drained my soul, and this is a problem. It’s a problem because tomorrow is the day. It’s the day I have planned for eight weeks. The day to break open my novel and read it for the first time. I should be excited and jittery, but I’m exhausted. My wonder has gone the way of dead kittens, and that is not a happy place. Do I seize the time I’ve carved for myself and read? Do I wait for the next free moment, even if it means waiting until November? Fostering was supposed to be fun and a great life experience. Who knew these tiny cats were so fragile? I haven’t felt this raw since the pediatrician uttered the words “failure to thrive” over my tiny daughter’s body. I was not a good mother to a newborn human. I am not a good mother to cat newborns either. They consume every ounce of me, these tiny new beings. I give more than I have and then I give more. Tomorrow. Do I read? Do I not? This too is supposed to be fun. The anticipation of the first read. The triumph or the tragedy when the last page is turned. I’m 6 weeks into an 8 week hiatus from my novel, Hallelujah, and have been working through a list of to-do items prepping me to get my book published. The last couple of weeks have completely flummoxed me. I went into this wanting to publish traditionally. I wanted to have Simon & Schuster, HarperCollins or Penguin Random House on the spine. (Uh, Penguin and Random House merged? I had no idea.) A couple of conversations with some friends of friends has made me wonder what my next step really is. A dear friend of mine suggested I spend my Sunday morning walking with Polly Letofsky. Thankfully that’s an organized event anyone can join every Sunday, so it wasn’t a weird idea. My friend knew that Polly had written a book about her experience walking around the world and she thought Polly might have some ideas about how to get my book published. What she didn’t know was that Polly had moved on to starting a self-publishing project management and consulting firm, My Word! Publishing. If you want to make money on your book, you make much less per book with a traditional publication (like $1/book) versus self publishing ($12/book). An average book sells 2,500 copies. An average self published book sells 250. You need to understand your own goals for publishing. The first two bullets are a math problem. Jojo sells 2500 copies of her first book and makes $1/book. Anna sells 250 copies of her book for $12/book. Who made the most money publishing her book? If you play the averages, self-publishing wins, but by only $500. However, this is where bullet number 3 comes in. Once I had time to think I realized that my goal is not to make lots of money. My goal is to get lots of people to read my book. In my dreamy dream world I want to publish a book that people want to read, which is measured by them buying lots of books. Jamie Ferguson is a friend of a friend and she published With Perfect Clarity in 2013. I read her book and we’ve had a couple of e-mail conversations back and forth. Hopefully we can meet in person and chat about her process in detail, but what I found out from her was that she also self-published through her company, Blackbird Publishing. When I found all this out I did a double take. This idea of starting your own company to publish a book seemed crazy when Polly mentioned it to me, and here I already had a data point telling me that was what people really did. Jamie had editors tell her that the book was good, but would be hard to publish traditionally and an agent who was interested, but wanted her to make big changes, so she self published. Both these conversations were interesting, and at least opened my eyes to what self-publishing means. I’m not as against that direction as I was, but I’m a little overwhelmed by the thought that I have to write a book and then find a team, and then pay the team to edit, market and publish my book. (If the averages work out I have $500 I could use to pay all those people and end up cost neutral.) The flip side is to continue to try the traditional route. I’m torn, but I don’t know enough yet. My next steps are to learn more by meeting with Polly and Jamie. I’ve got two weeks left until the big read, and I’m pretty comfortable where everything stands on my list. I’ve got some work to do on a CV, and I have two more personal connections to exercise. (I may wait on both of those until after the first reading, because they are connections I don’t want to use unless I’m really going to publish this thing.) The only other item on my list is an elevator pitch, and that’s got to wait until I read, because I’m starting to forget the details of my book. That was the whole idea of this little break. I’m getting excited and nervous for two weeks from now. Back in June I blogged about going to see my BFF Neil Gaiman speak and his message to new writers. Like many other established authors out there, his suggestion was to finish something, then get it out there. Since that day I have finished a first draft of a short story and my first novel. While waiting for my novel age, I have been working on nine tasks to get me ready for the effort of creating a second draft of my novel then finding an agent and publisher. One of those tasks was to polish my short story, The Fisherman, and get it out there. Well, I actually said “see how I feel about getting it out there,” but honestly, I feel pretty darn good. It is out there. Monday night I corrected my last few inconsistencies, paid my $15 and hit submit. My story is now officially in the Glimmer Train Press “Short-Story Award For New Writers.” Can I get a hallelujah?!? I’ll find out by November 1st if I win or not. Time for more waiting. I need a reader who believes in me, loves my work, and will remind me why I’m doing this when the bathrobe lady takes over and wants to hide in the basement burning my novel. I’m lucky enough to have two of those readers. One of them is my mom who also happens to be my ideal reader and my first editor. The other one is a dear friend who makes time to encourage me even while she’s living her own crazy life. Having that really honest joyful reassurance is so important. Find that person. Buy them presents. Nurture them because you are going to need them. I need a reader who is pragmatic and good at the rules of grammar. My husband had to read my story twice this weekend. The first time he agreed with my mom, “Yeah, you’ve got a lot of ‘ands’ in this story” and the second time he found two inconsistencies that were nit-picky but the difference between a kind-of-final draft and a final draft. Having someone who will know if your prepositions don’t match is awesome. He never gushed about my story, but that’s okay. Other people handled the gushing. I need a plan. If the story doesn’t make Glimmer Train, that’s okay. The deadline for the Writer’s Digest Short Short Story competition is November 16th. That’s where The Fisherman is going next if it doesn’t find a home at Glimmer Train. What’s the difference between the first and second versions. Lots of stuff, but in my mind the difference is that in the first version I am paranoid that the reader won’t see what I want them to see. So I paint a very detailed picture in a very complex sentence. I give them a magnifying glass and some paint of their own – in case they don’t like what they see – and a guided tour of the picture complete with one of those narration phones you get at a museum. In the second version I am brave. I assume the reader has their imagination on and can paint their own picture in their mind and we can move on together. Are their orange puffy clouds the same as mine? Do they really understand the conditions? That is scary, but my favorite part of the story is the magic, but through over-describing (The child is excited and terrified. The dad is teary-eyed and proud.) I was losing the magic. Thank goodness by nature I’m a taker-outter and not a putter-inner, so the edits weren’t hard once I knew what they were. I honestly believe that every reader has “better things to do” than read a book. They have bills to pay and mother’s to call and a house to clean and kids to bathe and endless ands to stick into their writing. If I make them work too hard they will leave. If I tell them exactly what they need to know, and maybe a little less, they will keep reading because they can’t stop. They will paint their picture in their head and want to know how it turns out. I want my stories to beg to be read, but if they are tedious because I am scared they won’t get read. So watch out novel! I’m coming to you and I am brave and ready to chop you down to size. I’m bringing my cheerleader readers and my nitpicker with me too. We are a fierce team and taking on new members if you want to join us. Only 59 days until I find out if I won the competition or not. 23 days until I can read my novel. Tick Tick. The posts are not about writing at all. I am writing the posts, but I write all my posts. It is the nature of posts. The posts are about publishing and the steps I am taking to get my work out there. So the new brand more accurately reflects what in the heck I’m taking about. Update is the most pointless word I have ever put in a blog title. I’ve used it twice. That is enough. Guess what all is up in my publishing process? Still no approval paperwork from the office. I’m getting annoyed, while trying to understand that my bosses boss probably has more important things to do than sign a piece of paper approving me to work outside of the office. Still, I’d like to start moving on my new domain and my CV. Bureaucracy. Annoying and hard to spell. I hate it. I’ve made other strides though. Tomorrow, or Monday at the latest, I’m sending in an updated version of my short story The Fisherman to Glimmer Train for their Short Story Award for New Writers competition. I spent one evening this past week searching through the contests and awards in the 2015 Writer’s Market trying to find something that appealed to me. After contemplating the Writer’s Market…. After scouring the Writer’s Market…. After scouring through the Writer’s Market, I had a list of 23 contests I felt my were a fit for my story, but I decided on Glimmer Train. Why? They only take unsolicited work. They have a new writer’s contest that closes August 31st. This forces me to do something right now. The contest is only $15 to enter. I love why the publication exists. They want to discover new writers. They read 30,000-40,000 stories a year and publish 40-50, but every story gets a chance. I love the tone of their site and the stories that they publish. I rush ordered Issue 92 of their magazine this week to read it and make sure my story is a good fit. I think it is. They accept simultaneous publications, so that means if I want to chase after some of these other contests it’s okay with them. They’ve got a pretty good track record of their stories going onto bigger and better things. I’m waiting for a final review from my mom editor, and then I’ll submit. Stop. EEEEK! I’m going to submit a story to a publication that receives 40,000 stories a year and publishes 40. (Worst case scenario.) That means I have a ONE IN TEN THOUSAND chance of getting published. If you like percentages, that is 0.1%. I didn’t pursue an acting career out of high school because there was only a 5% chance of making a career out of it. I do not do things that are this unlikely. What am I thinking? Deep breath. I really am quite glad that I’m not an actor. Deeper breath. I have a 0% chance of getting published if I don’t submit my story. Deepest breath. It’s okay. The worst thing that will happen is my story will not get published and that’s exactly where I am right now. I also spent some time building a list of books I love that were first books for the author and reading through the acknowledgements and about the author pages to see who their agent is and looking them up. Nothing concrete happening there yet, but it’s an interesting list. Finally, I’ve almost finished reading the book that my friend’s ex-wife wrote. When I’ve read that I’ll ask for an introduction. I’m also going on a walk with another friend of a friend who published a memoir. I’m working the network, because four weeks from now I will have just finished reading Hallelujah for the first time and will need to figure out my next step: copies for all my friends from Kinko’s or moving toward publication.